People seldom convert on their first visit to your website. Research suggests up to 98% of first-time website visitors don’t. That’s a lot of people. Unless someone is making an impulse purchase, they research their options, refine their preferences, make a decision and then purchase. The length of time this process takes varies based on your business, product or service. Building a customer journey map will help you decipher your customer’s journey. But one thing’s for sure—at some point, you need to bring those initial 98% of non-purchasers back, maybe multiple times, and convince them to convert. It’s called retargeting. In this blog, we’ll be covering everything you need to know to create successful Facebook retargeting campaigns. Retargeting ads are where the target audience of your ad campaign are people who have already interacted with you. They therefore know your brand and, in theory, have a higher level of intent than general prospecting audiences. Most people think of retargeting as solely website based—retarget people who have visited your website to bring them back. While this is the core tactic of retargeting, Facebook allows you to retarget people who have engaged with you in other ways as well. They may be on an email list, have watched one of your videos or engaged with your mobile app. There are lots of possibilities. All of these involve you collecting data about the user’s engagement, creating target audiences based on these interactions and building campaigns targeting these audiences. For website retargeting, you collect the necessary data by installing a pixel on your website. If the person visiting your website is logged into Facebook, that website visit will be connected to the user via your pixel. You can then populate various Custom Audiences with this data. We’ll get into more detail on how to do this in later sections. 69% of shopping carts are abandoned without ever completing a purchase. Retargeting can increase ad response up to 400%. Depending on what kind of retargeting campaign you want to run there are a few things you need to set up to get started. We’ll run through the essentials below. 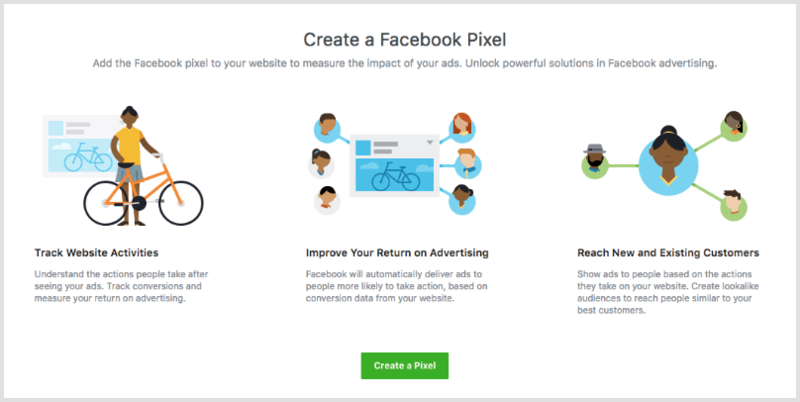 If you want to retarget people who have visited your website, you need to set up the Facebook Pixel. It’s a little snippet of code that you install on every page of your website and will track the visitors to your website. You can begin setting up your Pixel by navigating to the Pixel menu item from your Business Manager. From here, click the green Create A Pixel button if you haven’t already created your Pixel. Then paste the Pixel Base Code in the <head> tag on every page of your website. Even if you don’t want to retarget people who take these actions, you should set up these events, as they’ll enable you to track the conversions that people make directly back to your ads. Alternatively you can utilize Facebook Custom Conversions. These only require you to add the Base Code to your website. You’ll create URL based conversions directly on Facebook, that will record a conversion everytime someone visits a specified URL, such as yourwebsite.com/thank-you-for-purchasing. To check you’ve correctly installed your Facebook Pixel, add the Facebook Pixel Helper extension to Chrome. Find out more detail on installing the Facebook Pixel here. If you want to track people who have interacted with your mobile app, you need to set up the Facebook SDK on your app. You’ll also need this installed if you want to optimize your ads towards app installs. You need to get your app developer to install your SDK, so I won’t go into the details of how to do that here. 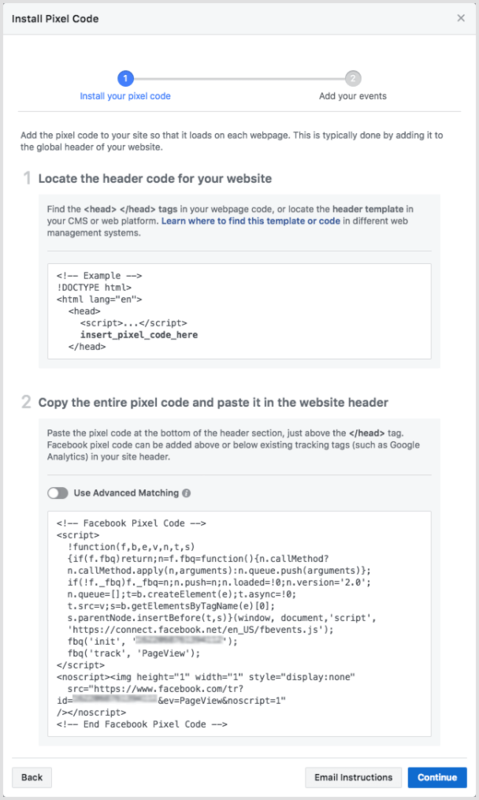 Facebook lists all the instructions your developer needs in the following article. Once you’ve set up the SDK, you need to register your app with Facebook where you will be able to link it to the relevant app store and Facebook ad account. You can retarget people who make a purchase in your physical store. To do this, you just need to utilize Facebook’s Offline Events. Setting them up involves uploading your purchase data to Facebook directly. You can do this either manually, via API or a partner integration. If you can automate the process of data synching, then you’ll be able to map your purchase data back to your campaigns as well as create custom audiences from your offline conversions. If you want to create dynamic retargeting ads—where you retarget people with specific products they visited on your website—then you need to set up a Facebook Catalog. The catalog is a data feed that contains all the details needed to dynamically populate your Facebook ads, including an ID, name, category, availability, product URL, image URL and other product attributes. You can create your product catalog in your Business Manager. Once you’ve created your product catalog you can set up a product feed to populate your dynamic ads. More information on the exact steps set up a product feed can be found in the following article. All your retargeting campaigns will be powered by Facebook Custom Audiences. They allow you to build your own lists of Facebook users to target. This is where all the data you gathered from your Facebook Pixel or Facebook SDK will be utilized for retargeting. You can begin creating your Custom Audiences from the Audiences menu in Business Manager. Click Create a Custom Audience to begin creating your first audience. From here, you can create Custom Audiences in a number of ways. Customer File: This allows you to upload a .csv or .txt file, copy and paste your own customer data into Facebook or sync your email CRM to Facebook. Website Traffic: Create lists of people who have visited your website, specific pages within your website or have completed one of the standard events you set up. You can add a timescale to ensure only recent visitors are included. In order to use this option you need to set up the Facebook Pixel. App Activity: Create lists of people who have downloaded your app or carried out specific actions within your app. In order to use this option you need to set up your SDK. Offline Activity: Create lists of people who have interacted with your business in-store or through other offline channels. In order to use this option you need to set up Offline Events. Engagement: Create lists of people who have engaged with you on Facebook. This includes people who have visited your Page, watched a video, responded to an Event or opened a Lead Form or Canvas. You can create audiences of people who visited every page on your website, only visited specific URLs, spent specific amounts of time on your site, or completed any of the standard pixel events you set up. You can also set time limits on the number of days someone is allowed in your list. For example, a list only contains people who match the specified criteria in the last 30 days. Give your list a descriptive name, such as “Adgo Website Visitors - 30 Days”. This will help you identify it when it comes to creating your retargeting campaign, as you’ll probably begin creating many custom audiences. After you create your customer audience, give it 30 minutes and it will show you the number of people in your list. From the Audience Manager you can create, edit and delete as many custom audiences as you want and include and exclude them when it comes to setting the targeting for your campaigns. This gives you some pretty powerful options for campaign targeting, which we’ll get into in the tips and strategies sections. Once you’ve set up your custom audiences, running a Facebook retargeting campaign is easy. Go through your usual process of campaign creation and at the Audience stage of creating an ad set, just select the relevant audience from the custom audience drop down box. Your ad set will now be targeting everyone from the custom audience you created. You can still refine your target audience the same as always, by demographic, interest, behavioural and connection data. Doing so will mean your target audience must exist in your custom audience AND match your other criteria selections. You can both include and exclude custom audiences from your targeting. This will come in handy. Right, so now you know how to set up a Facebook retargeting campaign, it’s time to cover some quick tips to get more out of your it. If someone comes to your website and doesn’t purchase a product, they don’t want to be followed by your ad for the next year of their life. No one does. Make use of Facebook’s day limit on your custom audience to ensure you’re only targeting people who have visited your website within a recent time period. Don’t just target everyone who visits any page on your website. The more website traffic you have, the more you should segment. Target people that visit specific pages that show conversion intent and retarget them with ads that nudge them towards your desired conversion. Exclude custom audiences of people that have completed your conversion. No one likes being targeted with ads for a pair of sneakers they bought from your website over a week ago. It’s annoying. So make sure you don’t do it. If you’re running a Reach and Frequency campaign, you can utilize frequency capping. This allows you to ensure that users only see a certain number of impressions of your ad within a set number of days. This helps you to stop being spammy. If your website retargeting audience is small, optimizing towards link clicks or website conversions may not be of much use—as you’ll reach your entire audience very quickly anyway. In this case, utilize Daily Unique Reach optimization, which allows you to optimize your ads to be shown to people once per day. The above rule still apples—you don’t want to be spammy. So only do this with very recent audiences. For example, anyone who visited your website in the last seven days. Don’t use the same old creative you’re using for all your other campaigns. These are hot prospects. Hit them with a specific, relevant message that resonates, tempting them back to complete the conversion they missed on their first visit. All your landing pages should be optimized towards their specific purpose. But this rule is doubly important for retargeting campaigns. You know your audience was close to completing a conversion, they were missing the final nudge or piece of information they needed to get them over the line. So remove the clutter. Present them with only the information they need to convert and, for goodness sake, optimize your pages for mobile. If your site takes longer than three seconds to load, you’ll lose half your traffic. Your website custom audiences will be dynamically updated by Facebook based on your pixel data. But so can your custom audiences based on list data. Many of the leading CRMs and marketing automation systems sync list data directly to Facebook custom audiences. Use these integrations to link your audience lists from your CRM to Facebook to ensure your advertising and email campaigns are in perfect sync. The EU’s General Data Protection Regulation goes into force from 25 May 2018. It’s going to have a big impact on how marketers can use data to retarget customers with ads in the EU. Familiarise yourself with the regulations. It’s likely you’ll need to get permission from customers to retarget them, so make sure you know what you need to do to comply. This article is a good starting point. Want to go beyond batch and blast retargeting of everyone who visits your website? Here are eight strategies you can use to get more out of your retargeting campaigns. People who start the checkout process but don’t convert are some of your highest value prospects. Don’t let them get away. Include a custom audience of people who have triggered the Initiate Checkout event on your website and exclude a custom audience of people who have completed the purchase. This will give you your abandoned checkouts. Retarget them with a message that pushes them over the line to convert. It could be a standard product ad or a more specific message, such as limited stock remaining or a reduced price offer for a very limited time. Email lists where people have intentionally given you their details—whether they be from blog subscribes, content downloads or enquiries—are high value prospects. They’re familiar with your brand and felt your offer was valuable enough to give you their details. Upload lists of emails directly to Facebook custom audiences to retarget prospects with an offer that takes them to the next stage in their conversion journey. You can retarget viewers of any video you post on Facebook, whether it’s part of an ad campaign or just one you’ve posted on your Facebook page. When creating your custom audience you can also specify how much of the video they need to have watched. This means you won’t be targeting people who have only watched 3 seconds of your video. Depending on the length of your video, create audiences of people who have watched 25%, 50%, 75% or 95%. This shows a much higher level of intent. Promoting a new product to past purchasers is an easy win. If you’re promoting something like a recurring event then target people who attended last time. If you have an ecommerce store, dive into your data to discover combinations of products that people purchase. Find the significant trends, then target people who have bought one product but not the other. If your app revenue relies on people making in app purchases or upgrades, then retarget based on events they trigger in the app. You can retarget people who have triggered a specific event in your app in the same way you can on your website. You just need to have the SDK correctly set up. As long as everything is in place, retarget people who haven’t made the upgrade yet with special offers or time sensitive deals. Utilize Facebook’s dynamic product ads for your ecommerce retargeting. You can retarget people based on the exact product they visited on your website and your ads will stay up-to-date with the latest product information, image and prices based on your product feed. It’s the easiest way to stay top of mind for shoppers who expressed interest in your products but didn’t buy them. Once you’ve got someone to opt-in to a Facebook Messenger chat with your brand, you can message them again as much as you want until they opt-out. Set up a chatbot and use Facebook Messenger as another distribution channel for your content and also sales support. Retarget your most engaged users by upselling other content offers and products that may be relevant. Create a multi-stage customer journey to attract, engage and convert your customers. This will require multiple layered custom audiences which exclude the custom audiences that are later in the journey. For example, a SaaS company could create a journey that initially retargets everyone who visits their blog with a message to download their eBook, then retargets everyone who downloads the eBook with a video ad about their product and finally retargets everyone who watches 75% of the video with a message to get a system demo. Customers (populated with everyone who is a customer of the system). This is just an example customer journey flow. The offers and campaign objectives could change based on your campaign goals. But the general flow of including and excluding audiences will be the same. Retargeting is one of the easiest ways to reach out to engaged audiences that already know your brand and have shown a degree of intent. While no one likes to be followed round the Internet for the rest of their lives once they’ve visited a website, taking smart measures and building targeted campaigns will ensure you’re not one of the brands doing this. On the contrary, you’ll be one of the brands that customers actually enjoy being retargeted by. What’s more, you’ll ensure you’re not leaving any potential revenue untapped. If you’re not retargeting, it’s time to start.